As a catastropharian, I’ve undertaken quite a lot of professional training in order to help assist my mid-size community through whatever disasters may befall. I live in a seismic area which is prone to large forest fires, and is situated in the middle of one of the largest nuclear missile fields on the planet. So right off the bat, I need to be prepared for earthquakes, fires, and nuclear Armageddon. To be on the safe side, I also prepare for other disasters such as blizzards, pandemics, EMPs, and meteorites, all of which are capable of blasting our comfortable way of life to bits. As part of my training, I’ve taken a number of Red Cross classes. One course taught me the nuts-and-bolts of mass shelter care. In that class, an exercise we undertook was to make a list of small items that would make people inhabiting a Red Cross shelter feel more comfortable. If they’d just lost their home and all of their possessions to forest fire or earthquake, and had come into our care with nothing but the clothes on their back and a heart full of anguish, what could we give them that would ease their suffering just a little bit? And so we made up our list: a comb or hairbrush; a wash cloth and towel and soap; a packet of tissues; a book to read. That scene really affected me. You see, I am indeed a survivalist; I hoard food and other useful items; I study survival manuals; I print out guides for dealing with radioactive fallout; I surf survival websites; and I keep detailed lists of my preparations. But I’m not one of those people who intend to don my camouflage, grab my AK-47, and guard my supply of ramen noodles to the death. Contrarily, my preparations are geared towards being able to help as many people as I possibly can on the day after the disaster. Here’s my elderly neighbors, who are dear people but totally unprepared; here’s my best friend, who secretly thinks I’m nuts for being a prepper; here’s my brother who is so busy raising four children that he doesn’t have the time or money to prepare; here’s the bed-and-breakfast across the street with seven bedrooms full of out-of-town visitors on any given night. Which of these people am I going to feel comfortable turning away? If I ever come across a miserable group of refugees huddled around a fire, I want to be able to take them in, not send them away. So I dug out the list from the Red Cross class. And I started thinking about other things that I could set aside in advance so that if a group of disaster victims ever turns to me for shelter, I can take them in to my own home and hand them a little bundle full of comfort. Thus began my collection of Zombie Care Kits. I live in a fairly large house and estimate I could shelter about ten people for a long-term stay. Therefore, I decided to assemble ten Zombie Care Kits and have them pre-packaged and ready to go. It started simply. First, because I live in a cold climate, I wanted everybody to be warm. So into each kit went a hat, a headband, gloves, socks, and those little shake-and-heat pocket warmers. Because noses will be running and wounds may be bleeding, I included a hanky and a bandana. 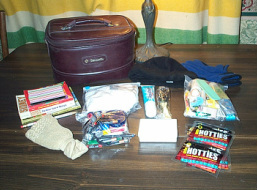 To take care of personal needs, I included a hairbrush, comb, barrettes and bobby pins; soap in a soap dish; a wash cloth and hand towel; a razor and mirror; deodorant, chapstick, toothbrush and toothpaste; shampoo and lotion; nail clippers and a packet of tissues. Because water may be in short supply, I tossed in a pack of wet wipes and hand sanitizer. I included maxi pads and tampons, not only for female hygiene, but also because they make excellent bandages. For first aid, each kit also got a selection of bandages and first aid tape; a pain reliever; a laxative and an anti-diarrheal; a tube of first aid cream; a small bottle full of vitamins; a sleeping aid to soothe troubled minds; and a packet of No-Doz in case the situation warrants staying awake. For sheer utility, I tossed in a cigarette lighter, a pocket knife, a flashlight with spare batteries, a light stick, shoelaces (with a thousand uses! ), safety pins and a sewing kit; a pad of paper and a pen and pencil; a sturdy Hefty bag and a draw-string laundry bag for keeping personal items bundled together; and a battery operated travel clock in order to tell time when electricity is out and cell phones don’t work. Thinking of the guests in the bed-and-breakfast next door, I added a map of the city and a map of the state to help them get where they’re going, whether it’s to the hospital or to a relative’s home in another town. For entertainment, every kit got a deck of cards as well as a paperback book explaining rules of card games, whether it be “101 ways to play solitaire” or “casino games made easy” or “Hoyle’s Rules of Games” or “how to win at bridge” or “best poker strategies”. Every kit has a magazine and a paperback book which can be swapped around after being read, and everyone gets several puzzle books such as crosswords, word searches, or Sudoku. I included a needlepoint or cross stitch kit project in each package, as well as some small game such as Uno or Boggle or Yahtzee. (I was sure to include the rules for such games.) Several of the kits contain crayons or colored pencils with pads of paper to draw on in case children are along for the disaster. Although I have food stockpiled in my home, I thought it was worthwhile to include a few small treats in each kit, so I tossed in a tin of Altoid mints, a roll of Lifesavers, a couple packs of gum, and a few strips of shrink-wrapped jerky. Most importantly, perhaps, each kit got a radio which is not only good for entertainment and morale, but is also essential for keeping posted on disaster developments. Each radio comes with its own set of headphones for private listening, as well as extra batteries. You may think this sounds like a terribly expensive project, but it really wasn’t. I sifted through the junk streams at my local flea markets, thrift shops, and garage sales for most of it. I hit the day-after-holiday sales for steep discounts on some items, such as rolls of holiday Lifesavers on sale for 75% off the day after Christmas, or 50% off Halloween light sticks on November 1st. Many of the items came from area dollar stores, or Costco, or a supermarket bargain bin. It was something that took quite a while to assemble, happening over a period of months as I slowly collected items while continuing to think up more things to include. You may also think that these Zombie Care Kits are large and bulky but that’s also not the case. At first they were each easily contained in a two-gallon ziplock baggie. Then I decided a sturdier container was warranted and I began to pick up small size travel suitcases commonly called ‘train cases’ for a dollar or two at the Goodwill or Salvation Army – the type of suitcases that are about a foot wide and 8 inches deep, designed to hold your hair dryer and your electric razor and all your personal needs while on the road. I was easily able to store ten such travel cases on a shelf in a closet, where they will be readily accessible should they ever be needed. 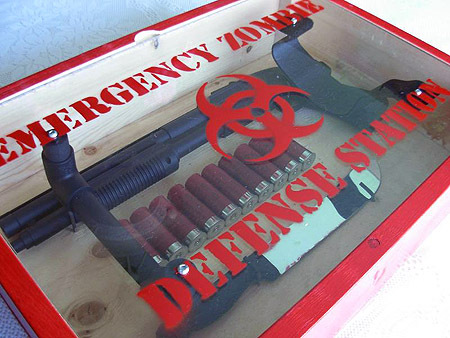 I continue to add to the contents of my Zombie Care Kits as my budget allows. Still on my list is a pouch of tobacco, which will bring enormous comfort to those suffering from nicotine withdrawal (thereby keeping the peace in the household), and will provide non-smokers with a valuable bargaining chip. For the utmost in post-apocalyptic home entertainment, a pocket-size 2-gigabyte MP3 player will hold hours worth of music or free downloadable audio books (available at Librivox.org or your local library), and can be purchased for about $10 each. A bottle of chlorophyll (not chloroform!) will definitely improve the atmosphere of the household if the toilets aren’t working and many people are pooping in an enclosed area. Chlorophyll – which is the stuff that makes plants green – takes away the odor and would be a valuable addition to the kits if we’re all huddling in my basement bunker waiting for the nuclear fallout to dissipate.